The Archaeological Site of São Miguel Arcanjo, popularly known as Ruins of São Miguel das Missões, and originally called Misión de San Miguel Arcángel, is the set of remnants of the old Jesuit reduction of São Miguel Arcanjo, a member of the so-called Sete Povos das Missões. It is located in the municipality of São Miguel das Missões, in the Northwest region of the state of Rio Grande do Sul, Brazil. The reduction of St. Michael was inserted in the vast program of evangelization of the Jesuits, which extended its arms to the east and to the west, leaving a strong mark in many countries of the world, perceptible until today. Founded at a time when the territory was Spanish territory, this reduction was the most notable of the Seven Peoples, who became an important part of the history of Rio Grande do Sul and Brazil and source of rich traditions. Constructed from 1687 according to a plan of advanced organization for its place and time, there arose a flourishing, economically prosperous and prolific civilization in cultural and artistic expressions, where European and indigenous elements were mixed, always, however, with the strong European orientation and Christian. But as soon as it reached its apogee, with the erection of its church, between 1735 and 1750, began its sunset. Involved in political and territorial disputes between Portugal and Spain and in the controversies surrounding Jesuit activity, it was one of the centers of the Guaraní War and ended up burned and depopulated in 1756. Restored and partly repopulated, it survived for a few years under a new administration, after the Jesuits were expelled and their Order suppressed, but it was already in decay. At the beginning of the nineteenth century it was plundered and its last inhabitants dispersed, making its ruin inexorable, falling in complete abandonment. The restoration of structures began in 1925, and since then the site has been increasingly valued, undergoing various restoration interventions and undergoing various projects to foster its material and immaterial legacy. Its church became one of the most well-known images in Rio Grande do Sul and the complex, a strong tourist attraction, still constituting the vital center of the city where it is located, which formed in its function and is intimately linked at multiple levels. Guarani indigenous communities in the vicinity have the place as sacred and as part of their memory and collective identity. 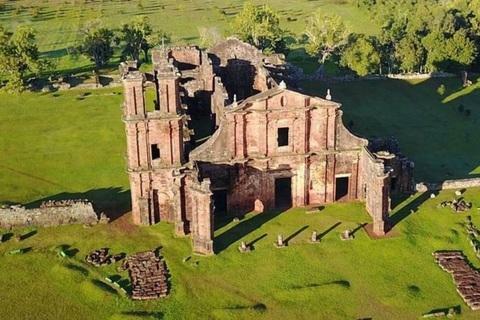 Because of its important historical, architectural and cultural value, the site was registered by the Institute of National Historical and Artistic Heritage (IPHAN) in 1938, it was declared a World Heritage Site by UNESCO in 1983, together with the ruins of San Ignacio Miní, Nossa Senhora de Santa Ana, Nossa Senhora de Loreto (Argentina) and Santa María Maior, located in Argentine territory, and in 2015 received from IPHAN the status of Brazilian Cultural Heritage for its associations with Guarani history and spirituality.